Between hosting weddings, corporate events and intimate celebrations, we invite you to join us for our educational tours, classes, tastings or farmhouse dinners to experience the best of our beautiful farm and food. 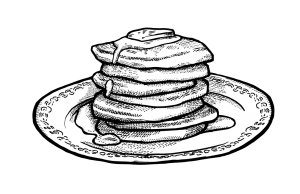 Chef Kieron Hales will be popping up at the Zingerman’s Coffee Company to flip his signature homestead pancakes! In addition to traditional pancakes, our May special flavor will be Honeyed Ham.